As a kid in the Melbourne seaside suburb of Beaumaris Linda Jackson drew big-eyed fashion girls and signed them "Original Linda". I can’t think of a better, and more telling signature for this iconic Australian fashion figure. I’m gong to call her a legend because that word is totally apt. It’s no exaggeration to say that Linda Jackson along with her friend JENNY KEE invented a new language for modern Australian fashion in the 1970s, after they returned from their respective travels – Linda from her intrepid journeys through Asia, inspired by her early love for National Geographic, and to Paris. And Jenny from several years at the epicentre of groovy London fashion, selling vintage clothes to Jimi Hendrix and the Rolling Stones from the Chelsea Antiques Market on the Kings Road. Back in Oz, what Jenny and Linda did through Jenny’s Flamingo Park store in Sydney’s Stand Arcade, and the fashion shows they staged together was to create an Australian style that came from within. Inspired by our own culture, flora, fauna and landscapes. Until then, the nascent Australian fashion industry mostly looked outward, copying what Europe did. But Linda and Jenny shook that whole thing up, and the world took notice. Before we recorded this interview, Linda was telling me about when Neiman Marcus took them to Dallas in 1986 ,they had this thing called Australian Fortnight, where linda had a dedicated boutique in which she showed her Desert Pea dress (check the show notes for a picture). Then in 1989, the V&A in London staged a show called Australian Fashion: The Contemporary Art, which heavily featured Linda and Jenny’s work. And then there was the time when Karl Lagerfeld used Jenny’s Opal Oz print for his Chanel show in 1983, and the times Linda and Jenny went to Milan and Paris and were photographed by Italian Vogue and made a big splash. In 1982 Linda opened her Bush Couture studio, stepping up the art aspect to her work. And began collaborating with indigenous women batik artists at Utopia Station. This Episode is about FRIENDSHIP, culture and respect, and valuing original voices. It’s also broadly about craft and technique and the hands-on practice of making clothes. And it's about Australian fashion history, and some of the important creative voices that shared it. A new generation of fashion innovators, in particular Anna Plunkett and Luke Sales, he designers behind ROMANCE WAS BORN, look to both Jenny and Linda as muses. LINKS TO MAKE YOU THINK..
1.Linda uses the term PERSONAL UNIFORM, which I've written about before. Here's the link to the story I mention on Sigrid McCarthy. Do you ave a personal uniform? If so, drop me a line. I love stories like this. 2. If you want to know more about that V&A show, and the Australian fashion scene in the 1980s, I recommend this excellent article by Janice Breen Burns. "In a study published in Nature in 2009, researchers identified two areas of the brain that become especially active when we meet someone new: the amygdala, the area of the brain that deals with emotion, and the posterior cingulate cortex, which is linked to autobiographical memory. As Karla Starr noted in Psychology Today, the posterior cingulate cortex also helps us weigh decisions and assign value to objects; we go through a very similar process with humans. 'And after we’ve assigned a value to a person, we make the decision about how to orient ourselves to that person,' she wrote. 'Do we want to get closer? Knowing what this person’s value is to us, do we want this person to be involved in our network?'" 1. of or concerned with the actual doing or use of something rather than with theory and ideas. "there are two obvious practical applications of the research"
2. (of an idea, plan, or method) likely to succeed or be effective in real circumstances; feasible. "neither of these strategies are practical for smaller businesses". Suitable for a particular purpose. "a practical, stylish kitchen". (of a person) skilled at manual tasks. "Linda will fix it—she's quite practical"
Linda's parents met ballroom dancing, which is a god excuse to share this. Fred & Ginger's finest. Gets me ever time. Enjoy. Peter Tully was an artist, jewellery designer and gay rights activist, who made some of the most extraordinary Mardis Gras costumes we've ever seen. In the late 1960s, while sharing a flat in Melbourne with Murray Kelly, Clarence Chai, and Paul Craft "he began making highly original party costumes from materials he found in second-hand stores". When he got back from travelling with Linda and photographer Fran Moore, he enrolled in art school where he met another of Linda's great collaborators, David McDairmid. There was a lovely exhibition earlier this year about Linda's work with David. Its curator Sally Gray has a book coming out about Australian fashion in the 70s and 80s - look out for it! According to MAAS, Tully became "one of Australia’s most significant artist/designers working in the field of jewellery and clothing. He used contemporary materials to explore the primitive and tribal behaviour patterns of post-industrial society and called this work ‘Urban Tribalwear’." "In our modern, globally interconnected society, it is more important than ever that people understand the world around them." - National Geographic, educating world citizens, exploring and protecting the planet since 1888. 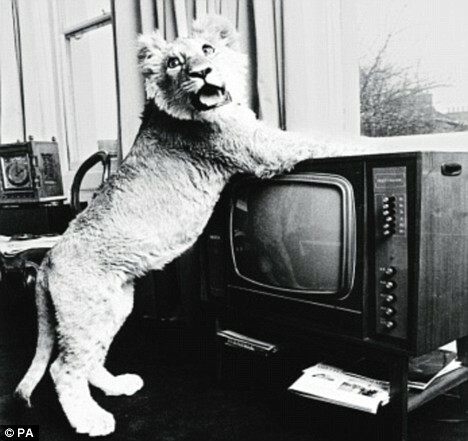 In 1969 two young Australians, John Rendall and Ace Bourke, bought a small lion cub from Harrods pet department, which was then legal. 'Christian' was kept in the basement of a furniture shop on the Kings Road in Chelsea, the heart of the Swinging Sixties.